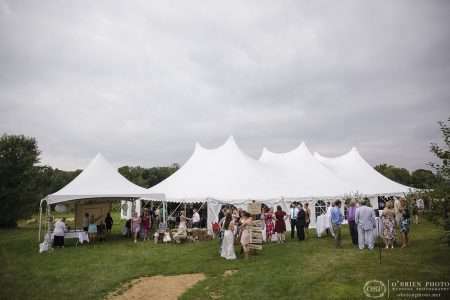 Are you recently engaged and are considering having a backyard tented wedding? If so, please keep these few tips in mind to ensure that your wedding goes just as planned! Always rent bathrooms. It doesn’t matter if you’re having a wedding of 50 or 200+ guests, you really don’t want that many people going in and out of your house. If you do plan to use your bathroom on top of renting portable restrooms, make sure you stock the bathroom with extra of the essential items. 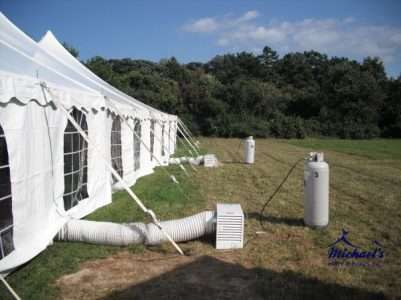 If you have a septic system, get it pumped prior to your wedding. Have a parking plan. If you don’t have the space to accommodate parking for your guests, consider having a shutter service from a nearby parking lot. If it’s going to be tight parking on your property or a far walk, consider hiring valet services. 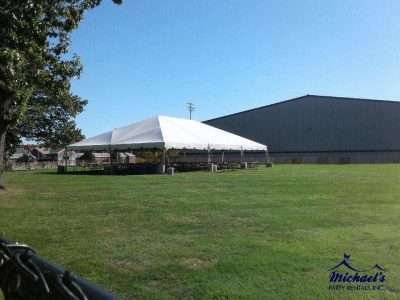 If you’re having an outdoor event, whether it’s a wedding reception, birthday party, family reunion, or just a fun summer get-together, you’ll want to consider renting these 7 items and here’s why! If you need protect from the sun or the rain, a tent solves both of those problems. 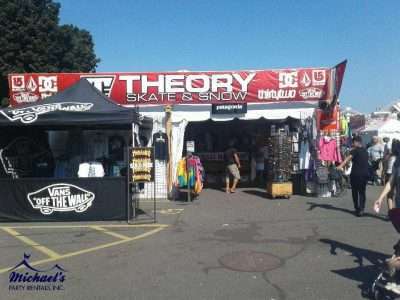 From frame tents to poles tents, we have a tent that will fit your style. Chairs are essential for all events. With a wide variety of wood or plastic, stackable or folding chairs, you have plenty to choose from. From buffet tables to tables for guests to eat at, we have many sizes and shapes! China. Flatware. Charger plates. We have everything you need for a a BBQ or a formal sit down meal! Cheers! Whether you’re serving water, beer, wine, mixed drinks, or other beverages, we have a glass for that. Add a splash of color to your party with our wide selection of tablecloths, runners and napkins. 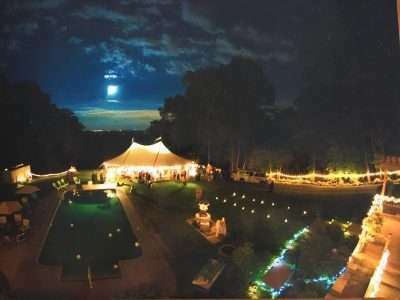 Don’t let you guests sit in the dark, make sure you add lights to your tent! And remember… these items are popular for a reason. Call us today to book your next outdoor event! We couldn’t have asked for better weather for Springfield College’s Homecoming! Big Fun at the Big E! 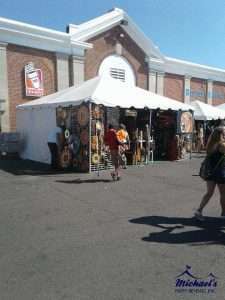 The Big E is known for good times and amazing food! 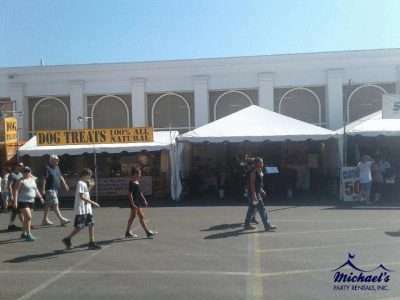 In order to execute this 28 day indoor/ outdoor fair, tents are needed! 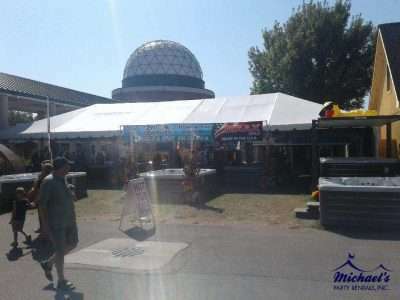 We are happy to supply the Big E with 45 tents ranging in size from 10’x10′ to 40’x80′! Some are used for bars and are custom logo-ed! Some are packed with skateboard and snow board equipment. And then some are filled with home decor! We can’t wait to see what our tents will house next year! WeddingWire just released what they predict is going to be the new 2018 wedding trends and we love them! Here’s what’s trending and how we can help achieve these looks! That’s right, we’re ditching the black tie and trading it in for an elegant midnight blue! With a wide variety of shades of blue linens, we’re sure we have somehtign that will add the perfect amount of elegance to your next event! We love all things metallics and we’re not saying gold or copper are on their way out but in 2018, many couples are opting for the traditional silver and chromes. From silver and pewter linens to our regency flatware, glass silver chargers and our silver chaiavri chairs, we can make your special day shine! Noticing a trend yet? Elegant Midnight blue mixed with silvers and chromes… that’s right, formal is making a comeback! With our high end glassware, linens and chairs, we have what it takes to flip any venue into a formal affair! We’re obsessed with this look! Instead of putting flowers on the tables, add texture to the ceiling and hang flowers down. 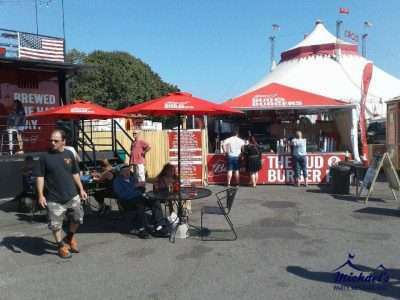 Our frame tents are perfect for this look but this can be achieved in out century tent is communicated with us! Couples are finding new ways to entertain guests. Surprise your wedding guests with something they wont expect. Think of creative food, live music or creative interactive photo booths. Your wedding guests do pay attention to the details and using texture is a great way to impress them. From using a silk tablecloth or a wax seal on the invitation, these will sure capture the attention of your guests. Yes we’ll eat our meals if they’re served on regular plates but think outside of the box. Have a raw bar or build something to hang food from. (ex. A wall with pegs for pretzels or donuts.) Serve food in unique glasses such shrimp cocktail in shooter glasses or tomato soup in a coffee cup. Cake is expected, but why not mix things up with desserts such as popsicles, custards or ice cream sandwiches? Don’t call it “rustic,” it’s all about the “woodsy” look. Good bye rustic and hello woodsy! The burlap barn look is making a transition to a more “woodsy” look. This look can be achieved with a lot of greenery in the florals and green as the wedding’s main color as well as tons of wooden accents. Williams Distributing invited their suppliers in for a Vendor Fair. 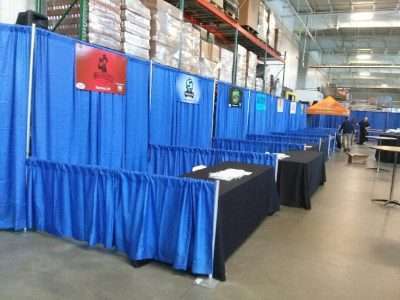 We created 10×10 booths with royal blue pipe and drape to match their business colors. We gave each vendor an 8′ banquet table with a floor length linen. In the center of the U-shape layout, we scattered cocktail tables for attendees to sip their beers around. 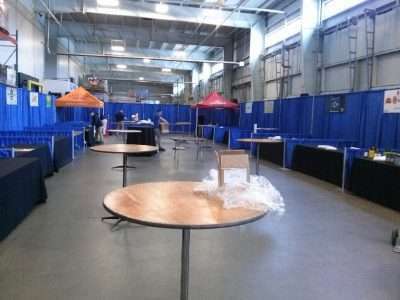 If you’re a business and are planning a vendor fair, give us a call! We have a wide variety of drape and tablecloth colors to match your companies colors! 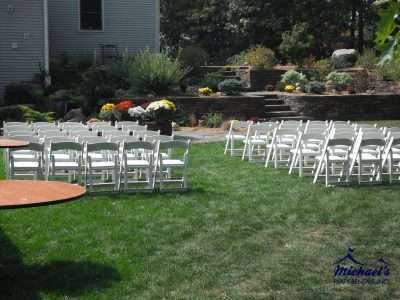 The Yiddish Book Center in Amherst, MA has the perfect patio for a wedding ceremony! 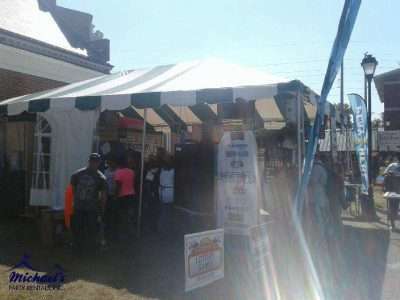 Whether you need a tent or just chairs, give us a call today! Nights are brisk and days are cool. But that’s no reason to cancel any outdoor party! However, it’s the perfect reason to rent a tent and tent heater! Put the heater in the back of the tent and you wont even know it’s there! 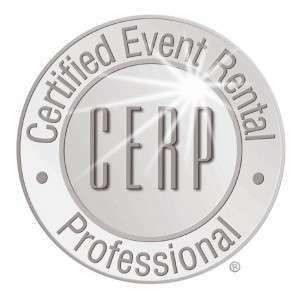 Besides renting chairs for ceremonies and different events, for a small fee we will also set them up for you! 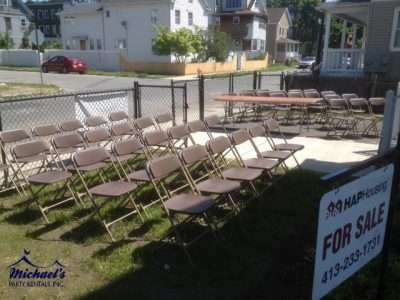 For just $0.40 a chair, our crew will set them all up however you would like on the day of your event and then take them down when your event is complete! 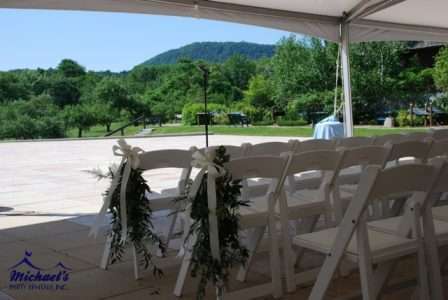 Over the past couple of years we have had the pleasure of working at some great outdoor ceremony sites in Western Massachusetts. 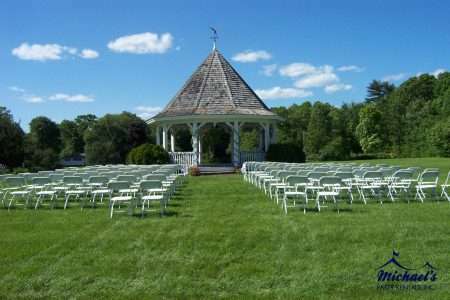 Another one of our recommendations is Fountain Park in Wilbraham, MA! 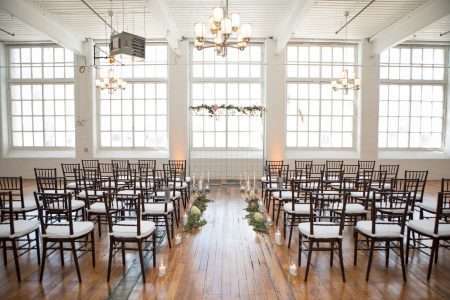 Give us a call to reserve chairs for your wedding!